Preface. Occurrence and Distribution of Vertisols (N. Ahmad). Vertisols of Africa. Vertisols of Australia. Vertisols of the Caribbean. Vertisols of India. Vertisols of the United States. References. Pedogenesis (A.R. Mermut et al.). Soil–forming factors. Soil–forming processes. Formation of Vertisols. Pedogenic models. References. Classification of Vertisols (W.A. Blokhuis). Soil taxonomy. The FAO–Unesco System. The World Reference Base for Soil Resources (WRB). The French Classification System (CPCS, 1967) and the "Référentiel Pédologique Français". The Australian Soil Classification. General discussion. References. Soil Morphology (A.R. Mermut, G.S. Dasog, G.N. Dowuona). Macromorphology. Micromorphology. References. Mineralogy and Chemistry of Vertisols (C.E. Coulombe et al.). Formation of vertisols. Mineralogy of vertisols. Chemistry of vertisols. Shrink–swell phenomena. Summary. References. Water Relations and Water Management of Vertisols (M. Kutílek). Porous system of vertisols. Soil water retention curves. Hydrodynamics in vertisols. Consequences for water management practices. References. The Structure and Grain Size Distribution of Vertisols (D. McGarry). Previous reviews. The description of structure in vertisols. Properties that influence the structure of vertisols. Constituent properties. External influences. Discussion. References. Tillage and Cultural Practices (D.F. Yule, T.J. Willcocks). Resources and tillage. What does tillage do to the soil? Consequences of tillage. Tillage effects on soil water processes and crop production. Cultural practices. Conclusion. References. 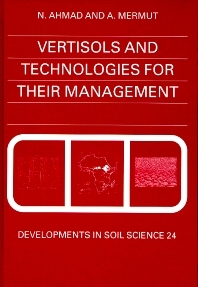 Soil Erosion and Soil Conservation for Vertisols (D.M. Freebairn, R.J. Loch, D.M. Silburn). Special features of vertisols. Management options for erosion reduction. An integrated approach to erosion research. Simulation of erosion. Application of erosion models in systems models. References. Management of Vertisols in Rainfed Conditions (N. Ahmad). Land use in crop production. Land use as pasture. Land use in agroforestry. References. Management of Irrigated Vertisols (N. Ahmad). Methods of irrigation applicable to vertisols. Problems associated with irrigation. Water use regulation and efficiency. Water quality and its monitoring. Water conducting system. Examples of irrigation use on vertisols. References. Management of Vertisols for Rice Production (N. Ahmad, W.A. Muirhead). Rainfed and direct seeding system with manual or mechanical land preparation. Rainfed or irrigated with transplanting system and manual or mechanical land preparation. Limited or full irrigation in which rice is grown continuously with fully or partially mechanised production systems involving direct seeding and dry/wet land preparation. Limited or full irrigation in which rice is grown continuously with fully mechanised production systems and wet land preparation. Full irrigation in which rice is grown for one crop each year in a system of crop rotation or alternative land use (Australian Practice). References. Cold Vertisols and their Management (A.R. Mermut, D.D. Patterson, P.A. McDaniel). Formation and distribution of cold vertisols. Characteristics of cold vertisols. Uses and management of cold vertisols. References. Geotechnical Problems Associated with Swelling Clays (D.G. Fredlund). Stress state variables controlling soil behaviour. Theoretical derivation for prediction of heave. Case histories. References. References Index. Subject Index. Vertisols, one of the eleven established soil orders, are clay soils with unusual and interesting properties. They cover more than 350 million hectares of land in the world and in tropical Africa alone there are over 100 million hectares. Because of their very small particle size and high surface area, these soils have higher physical and chemical reactivity than other soils. Their interaction with agrochemicals/industrial wastes, has been, increasingly, the subject of research especially in the last two decades. Vertisols create special problems when used for engineering purposes. This book is intended to provide comprehensive and state-of-the-art information about Vertisols worldwide. Special attention is given to the use and management of soils such as fertilizer use, crop selection, soil tillage, water restriction on land including irrigation, and soil erosion. A special chapter has been added to deal with geotechnical engineering of Vertisols. Vertisols have great potential for agricultural production but many, especially in the developing world, are underutilized due to a lack of understanding regarding their behaviour and management. This book is written by leading scientists worldwide. It is expected that this monograph will be of great use to soil scientists and agronomists, graduate and senior graduate students. Improvement of their management may solve the current food deficiency in the world. @from:K. Auerswald @qu:...Although this book was written by 19 authors, its topics and information are well coordinated. The editors, who are authors or co-authors of half of the chapters, have done a very good job. This good coordination between chapters is evidenced, for example, by minimal overlapping of the references although each chapter is supplemented with 50 to 200 references. Thus, in addition to the tremendous amount of information gathered in the book, the reader is also supplied with many references from which he can find even more details.